Audrey Elisabet: GIVEAWAY | Audrey Elisabet. Last weekend I mentioned a project I have been working on. I have been working on this for quite some time. This summer my family moved and I helped my mom go through some old stuff. One of the things that caught my eyes was a really old Icelandic cross stitch pattern booklet. My mom told me that it was my my great-grandmothers. I can't find any date on it but it seems like it could be around 100 years old. I asked my mom if I could have it and she said yes. There are so many beautiful floral patterns in it. So that is what I have been working on. The winner of the giveaway will receive the first flower I made from the booklet. 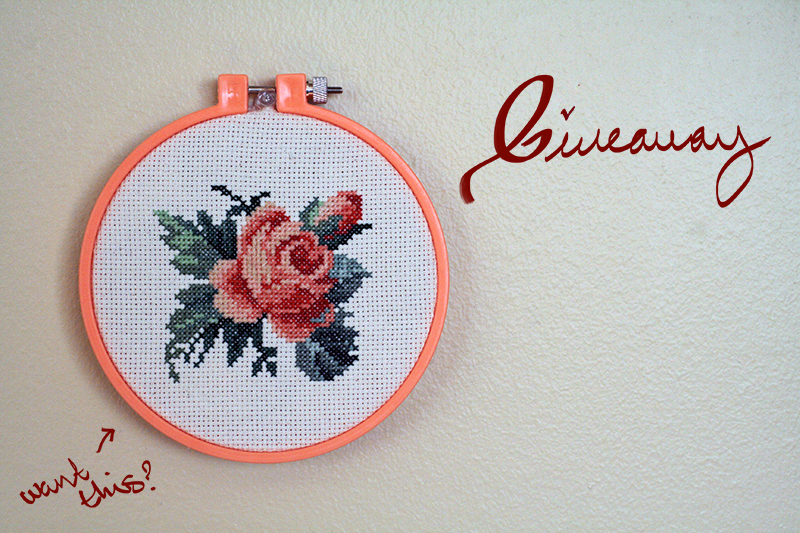 It will come in a 5 inch wooden embroidery hoop, not the horrible orange one on the picture. To enter the giveaway, all you have to do is "like" my page on Facebook and comment on this blog post. (If you have already liked my Facebook page you just need to comment). The giveaway will be open until the end of the month and I will announce the randomly chosen winner on the 1st of February.